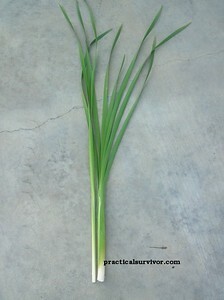 We will post pictures of the plants as we harvest them under that particular season. We practice extreme caution when learning about edible plants. 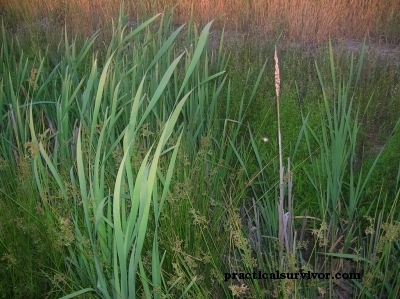 Many plants that are edible have poisonous look-alikes and one part of the plant could be edible while another is not. It takes a lot of reading and practice to know the plants in your area. It is good practice to only eat a small piece of a plant. The best practice is not to eat anything that you are not 100% sure is safe. Many pages cover a document called the Universal Edibility Test. While the document makes a few good points, the test could get you killed. 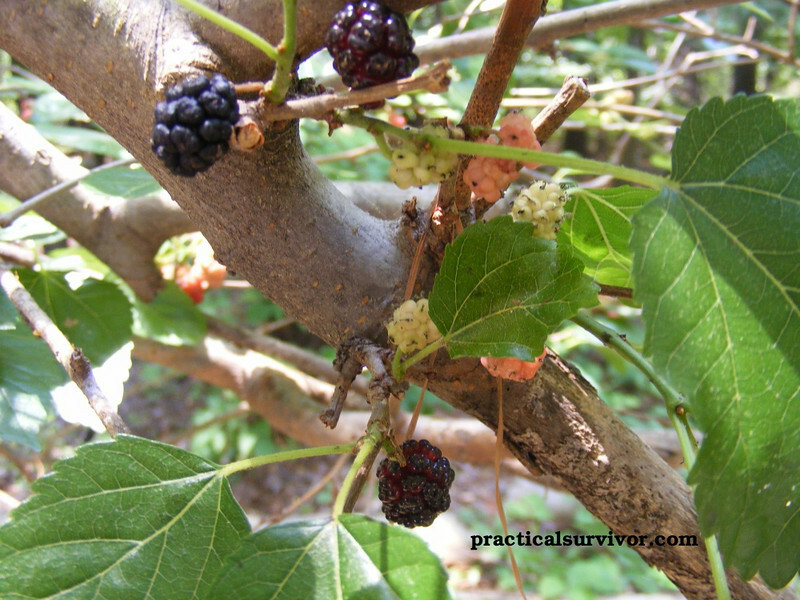 Our point being, during a survival situation is not the time to test if a plant is poisonous. We test the plants while in civilization and we stick with plants that have no known poisonous look-alikes. 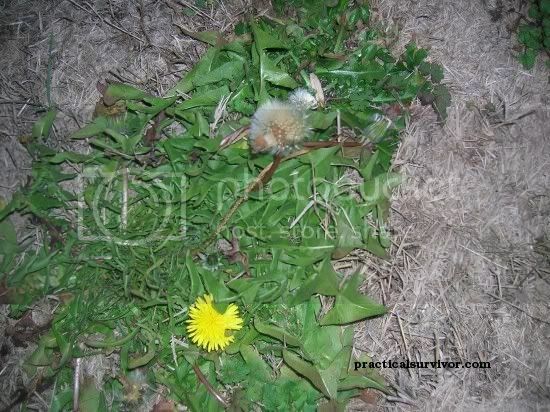 Want examples, properly prepared acorns or dandelions. Again to make it clear, there are plants have both edible and toxic parts. Unless you know what you are eating, do not take a chance. Members of the nightshade family (Solanaceae) can be rich in alkaloids (Solanine). 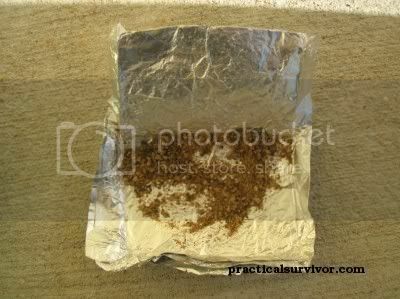 Depending on the amount ingested symptoms include: headaches, diarrhea, vomiting and even death. Solanine is found in potatoes, eggplant, and tomatoes to name a few. Research solanine and potato to learn more. 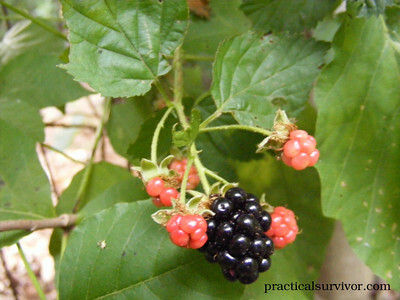 Some edible plant guides will tell you a plant does not have a poisonous look-alike while others will tell you there are similar plants that are very toxic. Never trust one source ! 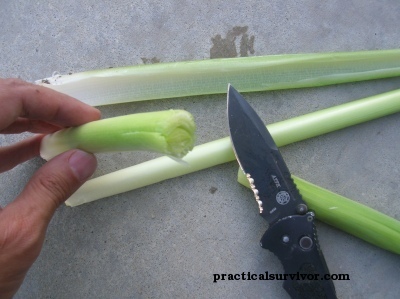 As we peel the stalk sideways we find the edible inner core. We can eat this raw, steamed or boiled. Sometimes added to soups. 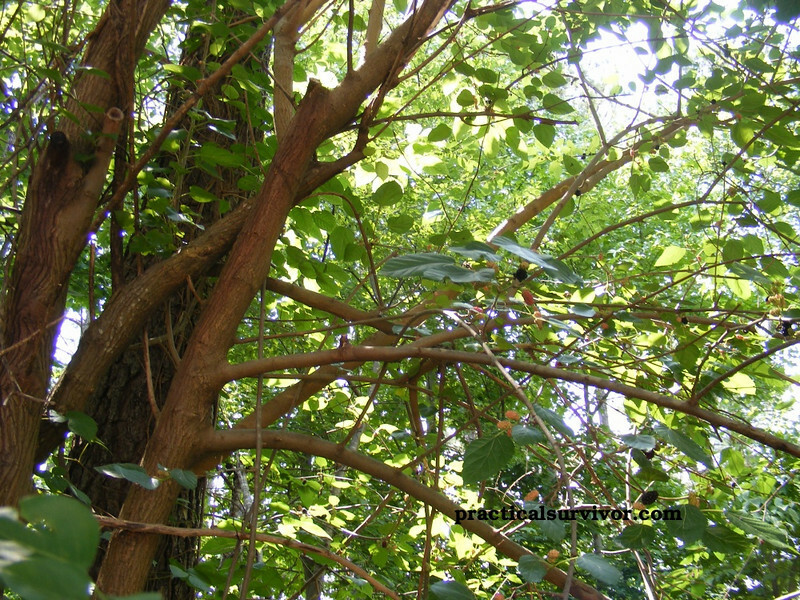 It is important to know the plants in the area and how they grow according to the season. 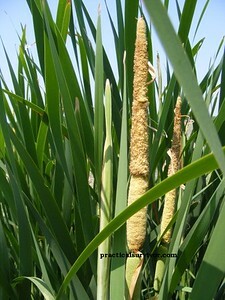 From spring to summer, the plant will start to create pollen. 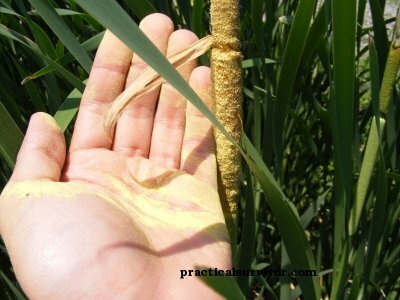 The pollen can be used like flour. 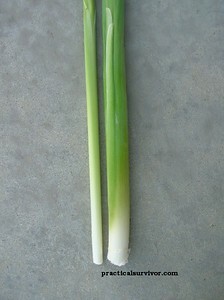 Preparation: Can be eaten raw, recommend boiling. We boiled the potato for twenty minutes. If the water source should be treated before drinking it, then any plant that grows near the water source should be boiled. Note: Arrow Arum has high levels of calcium oxylate. 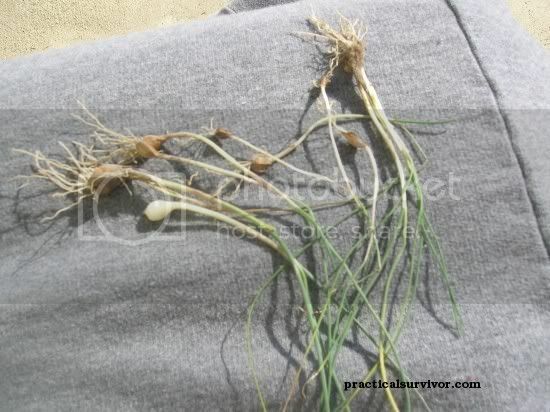 Even after boiling parts of the plant for twenty minutes, the plant will make you sick. Will cause vomiting, sweat, and diarrhea. The leaves should be studied closely and the tubers look nothing alike. 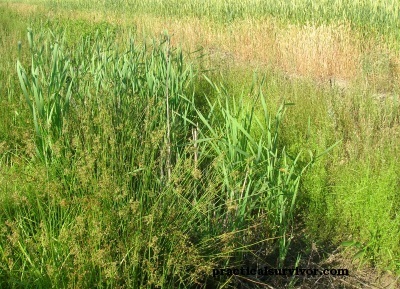 Wapato will also flower during mid summer with a three petaled white flower. 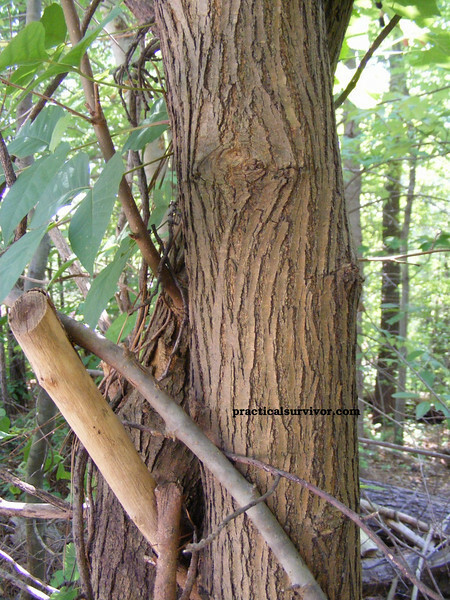 Pretty much the entire plant is edible and is also known for medicinal values. We were blessed to find this great patch of Kudzu surrounded by Blackberries. The leaves can be eaten raw, steam or boiled. The root can be eaten as well. Kudzu flower blossoms smell absolutely great ! Unmistakeable smell of grape. The flower can be used to make Kudzu Jelly. 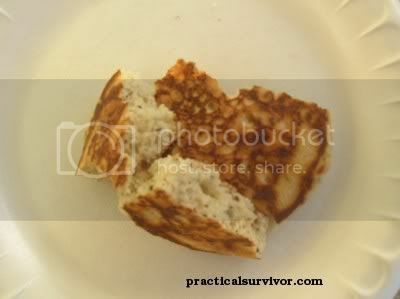 Both the pads and the fruit can be eaten. Prickly pear jelly is often found in the South-west states. The pads are supposed to be best if gathered in spring. The fruit here was a little past its best point. The color of the fruit will be a dark wine-like burgundy. "Prickly pear cacti typically grow with flat, rounded platyclades that are armed with two kinds of spines; large, smooth, fixed spines and small, hairlike spines called glochids that easily penetrate skin and detach from the plant. Many types of prickly pears grow into dense, tangled structures." The fruit of prickly pears, commonly called cactus figs, Indian fig or tuna, is edible, although it has to be peeled carefully to remove the small spines on the outer skin before consumption. If the outer layer is not properly removed, glochids can be ingested causing discomfort of the throat, lips, and tongue as the small spines are easily lodged in the skin. Roasting the fruit is one option to remove the glochids. Nutritional value: Vitamin A, C, and iron. The leaves carry more iron than spinach. The entire plant can be harvested. The taproot can be difficult to uproot. 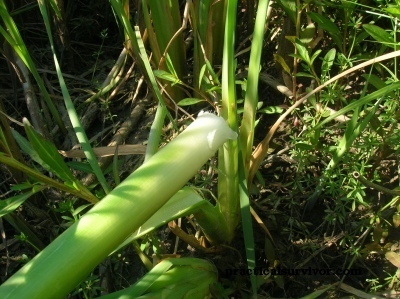 The plant can be eaten cooked or raw. Boil the root, sometimes changing the water to take away bitterness. The young leaves and buds can be eaten raw in a salad. 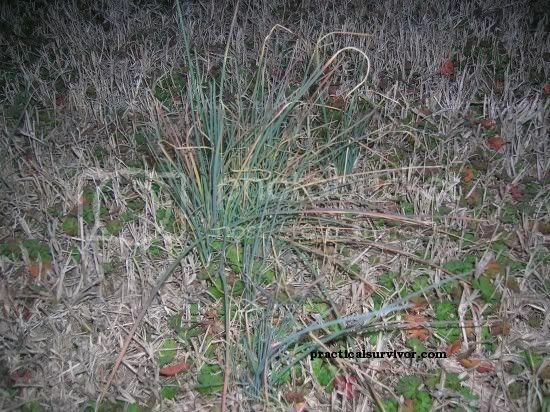 Often called Wild Onions, and sometimes ramp. From what I read the leaf of wild garlic is supposed to be round and hollow while wild onion is flat. Wild garlic grows in most of the United States and parts of Canada. 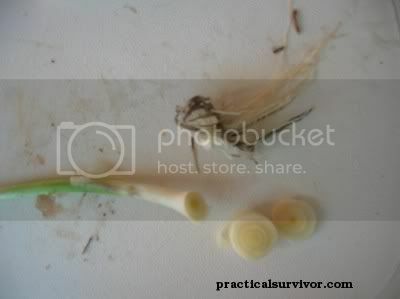 We added the wild onions to salad with vinegar and they tasted great. Wild garlic is edible and it has also been known to work as a bug repellent. If you read around, you will find that some companies sell garlic products by the gallon to spray on gardens to repel insects that attack plants and trees. 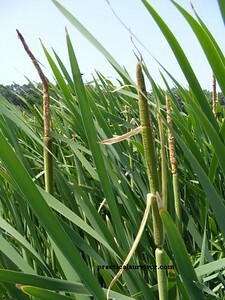 Cattail 'root' rhizome are very starchy. My personal experience is they are nothing like a potato. Different parts of the plant are edible at different times of the year. 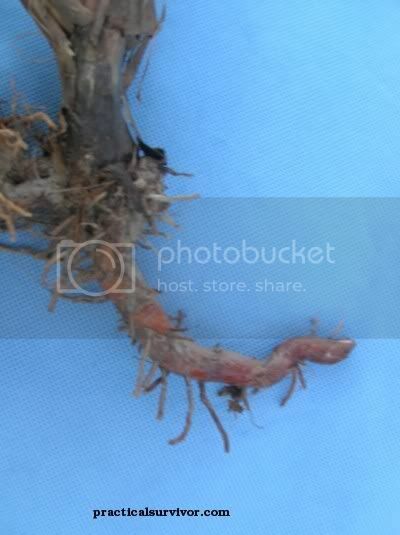 In winter we seem to be stuck with just the rhizome. 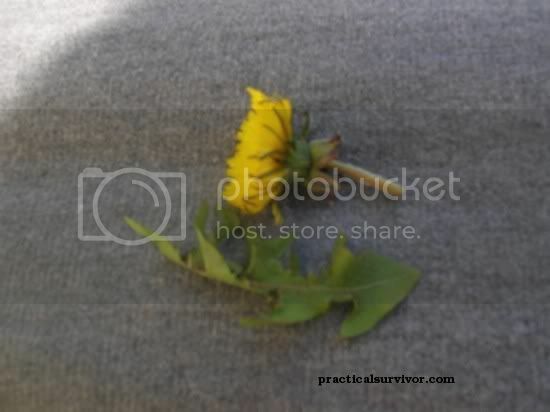 In spring, summer and fall we will cover other parts of the plant such as the pollen, spikes, and shoots. Note: There are different types of red and white oak. Acorns contain carbohydrates, protein, amino acids, vitamins, minerals and even fat. 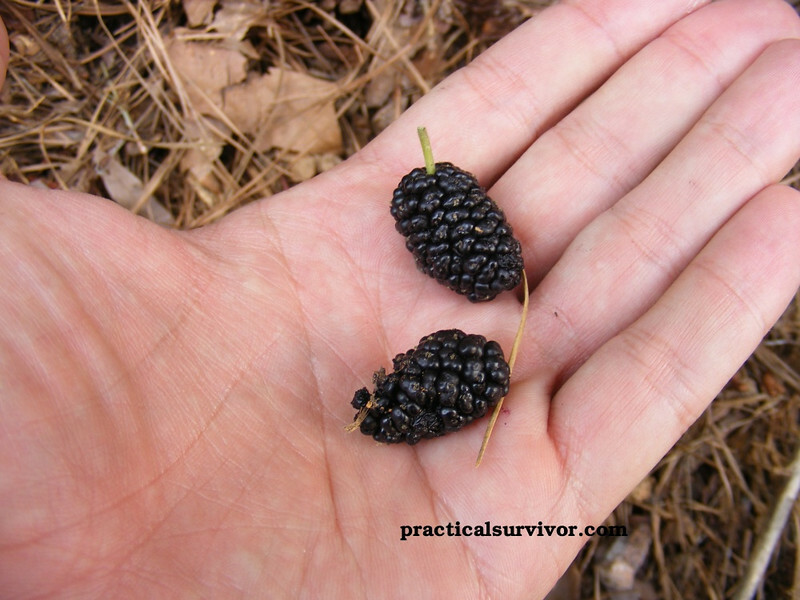 Although they must be prepared to eat, they are an indispensable part of a wilderness diet. The native Americans would harvest the acorns to help them pass the winters. Acorns have the advantage of being a food source that can be stored. 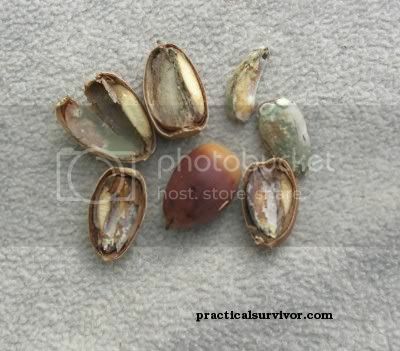 Acorn fat can cause the acorns to get moldy or rotten. Preparation: Tannin should be removed from the acorns. Reducing the tannic acid from the acorns by soaking them will make them more palatable and less toxic. Some people soak the acorns a process called leaching. Others grind the acorns into flour and then treating it with hot water. Finally boiling the acorns is suggested for rapid removal of the tannins. We soaked the acorns for three days after peeling the outer shell. 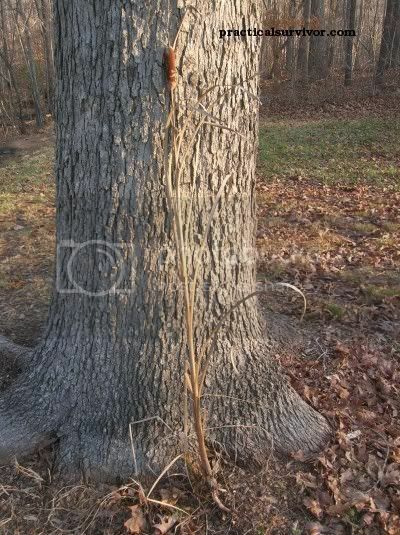 the bark and fruit of various plants, especially the nutgalls, certain oaks, and sumac. Tannic acid can be harmful to the human body. ** It seems tannic acid is known to reduce protein digestibilities. "Apparent protein digestibilities were reduced by tannic acid and quebracho diets. Only the 8% tannic acid diet tended to increase glucuronidation"
The human body uses glucuronidation to make a large variety of substances more water-soluble, and, in this way, allow for their subsequent elimination from the body upon urination. We want to avoid eating the tannin because it could cause digestive problems. When the Native Americans would prepare the acorns, they would put them in running water for days. Some people use the boiling method. We will be doing more testing. We ate an acorn before leaching the tannin out of it. Since they are moldy, they were chewy and the tannic acid caused a bitter taste. Overall the taste was that of a nut. Most sources say that white oak acorns have the least amount tannic acid in them. 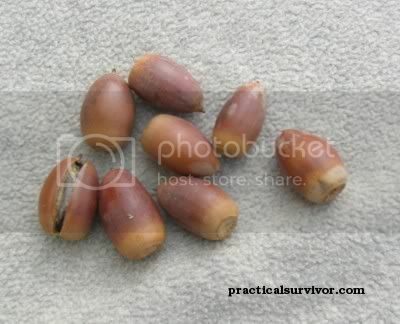 This set of acorns was not very bitter but we still allowed the acorns to sit in water for three days. Changing the water periodically. Some people say to use a boiling to speed up the process. We will research different ways of removing the tannin from the acorns and include them on the article. We soaked the acorns for three days and dried them. Eating them and then crushing them into meal. 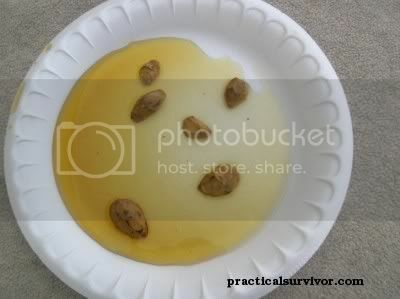 Here we use the acorn meal to make pancake mix. Nutritional value: protein, carbohydrates, vitamin A, C and amino acids. There are over a hundred different species of pine. 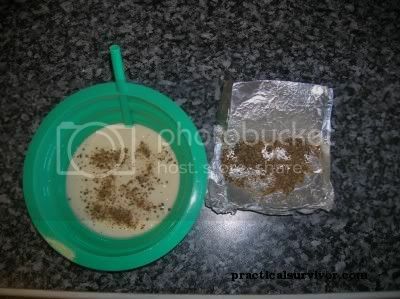 Not only can the food be used as a supply of nourishment but, also can be used for medicinal purposes. We cut the needles and add them to the bowl. There are two methods people normally use. One is to add the needles and simmer for fifteen to twenty minutes. The other is to boil the water first, and soak the needles for ten minutes. Surprisingly the Pine needle tea does not taste as strong as most people would think. Add a little sugar if available. My wishful thinking is that the tea will act as a treatment for sinus symptoms. High in vitamin C content pine needle oil is used by some in aroma therapy for sinus and infections of the respiratory system. It is also believed that eating honey from your local area may help with seasonal allergies. Honey is known for having many medicinal properties. The expectation being that the pollen gets mixed with the nectar during the gathering process. The claims are that eating the local honey will help lessen allergy symptoms. Now I like to keep an open mind so this is all speculation on my part. The way I see it is, some of the beneficial effects of pine needle tea have been confirmed. Vitamins and minerals found are beneficial to humans. So I drink it, and nothing negative can come from it. However, it never ceases to amaze me how quickly people are willing to put a pill in their mouth because their doctor says it is going to help. This is done without any research, after being told of horrible symptoms, and the daily media posting about horrific side effects of miracle drugs. Yet when offered a possible solution from nature, they become very skeptical and misanthropic. Some argue that the pine needle oil has antimicrobial, antibacterial and antiseptic properties. On the other side some companies have been penalized for making false representations about the overall benefits of bee pollen. So do your research and make an educated decision. This seems to only affect cattle. We do not know if it affects humans, but perhaps a caution to pregnant women should be mentioned. The ranchers in our area of central BC know well the effects of having their cattle drink from puddles in which pine needles have been soaking. The cows will abort their calves. scroll down to page 15/16 for the information. The USDA government web site includes a map of Canada and the United States with each plant. The map covers areas where the plant is available. The site includes a name search engine.